If you’ve ever had to wash your hands in a public restroom, you’ve probably run into a hand dryer or two. In fact, these machines had greatly reduced the amount of paper waste we were making before we started using dryers. However, one of the biggest disadvantages of using hand dryers is the often incessant noise they make. So I’ve hunted down the best quiet hand dryers on the market to review. Before I jump into the reviews, I’ll talk a bit about the things you should be looking for when you go shopping for quiet hand dryers. But first, let’s talk about why you’d need one at all. At some point during the past century, we started seeing more and more automation in public restrooms. Park bathrooms suddenly had movement activated automatic faucets and shut off when you’re done. That invention saved a lot of water that would’ve otherwise been wasted — which is the same thing hand dryers set out to achieve. Actually, both of these inventions were popularized at about the same time in the mid 20th century. And, by now, most hotels, airports, malls, and office buildings use both of these technological advancements. Ultimately, hand dryers are the most budget-friendly option, especially for office buildings. In fact, businesses could completely replace all future paper towel expenses by making this one-time purchase. And if you wanted to save on water and paper towels at home, you could get an automatic faucet and a small hand dryer for personal use as well. However, as convenient as hand dryers are, they don’t have a great reputation. Actually, the amount of noise they usually make is their greatest downfall. Children are especially apprehensive about being around them because of the whirring noise they make. Fortunately, the newer models are much quieter, so I was able to find several great products for my list. Aside from the amount of noise some dryers make, there aren’t many other drawbacks to getting one. Still, I’ll endeavor to mention a few for the sake of transparency. So what are some flaws hand dryers have, aside from the amount of noise they tend to make? Well, for one, many people don’t actually like drying their hands with a gust of hot air. In fact, many people prefer to use paper towels. However, at least in my opinion, those are hardly the most eco-friendly option you might use. But let’s consider the alternative — cloth towels. If you’ve ever lived in a full house, you probably know that cloth towels get disgusting really fast. If you have the misfortune of being the second or third person to wash your hands, you’ll probably be stuck with a towel that’s already wet. Obviously, if you’re worried about bacteria growing in your cloth towels, you’ll want to wash them frequently. But washing your towels often means that you’re doing more laundry and wasting even more energy than you would if you just used a hand dryer in the first place. However, if you don’t get a high-quality hand dryer, you may end up with one that’s prone to breaking. After all, what’s the point of replacing paper or cloth towels with a dryer if you’re only going to end up having to call an electrician to fix it every few weeks? And, you’d just have to use towels in the meantime anyway. But that’s exactly why investing in a quality hand dryer is so important! So let’s talk about how to find the best quiet hand dryers money can buy. If you’ve had a chance to see one of my other quiet product reviews, you’ll know which features I prioritize when I’m looking for great products. Typically, the level of noise these types of products make is closely related to their power use or speed of operation. So let’s talk about whether that rule applies to hand dryers. If you’ve ever had a chance to use a really old hand dryer, you were probably glad to get out of that restroom. Those things were so loud already! And to make things worse, the porcelain tiles caused the sound to bounce off more times than it would against softer materials. That’s actually the reason why bathrooms tend to echo. While you probably can’t fix the material the bathroom walls are covered with if we’re talking about an office bathroom, you can suggest that your company get less noisy hand dryers — especially if the ones you have are outdated. In fact, old high-speed hand dryers usually emit upwards of 90 and even 100 decibels. For reference, that’s about the same amount of noise a power mower or a jet would make. However, most of the products on my list are all between 50 and 80 decibels. So what makes them so silent? There are two main types of hand dryers you’ll find if you start digging. The first type is often called traditional dryers because you have to press a button to get them started. The second type according to the activation method are the automatic dryers, which are triggered by motion or proximity. You might think that the hands-off approach is the more sanitary one. However, automatic dryers aren’t really the most popular type, as far as I was able to discern. Many people actually prefer hand dryers you need to physically turn on simply because they’re more reliable than motion activated ones. Traditional hand dryers are usually more affordable too, although they’re often less energy efficient. Usually, that’s because they take up to a minute to fully dry your hands. However, because they’re slow, they also tend to operate more quietly than automatic dryers. Besides, many button-activated hand dryers are now much faster and more energy efficient. What do people mean when they talk about hand dryers in terms of energy efficiency? Really, this is a bit of a non-issue. As I have mentioned before, you’d be paying more for paper towels on an annual level than you would for the operational cost of a dryer. If you want to know exactly how much it would cost you to dry your hands with a hand dryer every day, you can use the same equation I mentioned in my reviews of quiet space heaters. Basically, you can multiply the dryer’s kilowatt per hour by your utility rate and the amount of time you’ll be using it. So a 2,000-watt hand dryer would be using 2 kilowatts per hour. We’ll use the same utility rate I used in the previous article, so $0.10. Even if you use the hand dryer for a total of 30 minutes a day, you’d still be left with a reasonable cost. If you multiply 2 kilowatts per hour by $0.10 by 0.5 hours, that comes out to a $0.1 daily operational cost. So you’d only be losing $36.5 annually, as opposed to the hundreds of dollars you’d be losing on paper towels. Even if you use the heat setting on the hand dryer, you won’t notice the cost difference. And the standby power on most automatic dryers is only 2 watts. Oftentimes, the speed is one of the first features you need to sacrifice in order to get a quiet product. In this case, though, I wouldn’t say that’s entirely true. You see, even the most powerful hand dryer would take a few seconds to completely dry your hands. As I have previously mentioned, the traditional dryers usually take quite a bit longer than that. However, most of the units I’ve chosen to review are more expeditious, with the average drying time being about 10–15 seconds. The last feature I’d like to mention is the installation process. Most hand dryers come with wall mounting hardware and tools, as well as a manual that’s usually easy to follow. I should also note that some models are so heavy that you’ll need to attach them to a wall stud. And then, there’s the matter of the power supply. Many hand dryers have a cord with a 3-pin plug, so you’d have to make sure that the unit is near the outlet. However, most people want a clean appearance out of their hand dryers, so hardwiring the machine is also a popular option. Of course, if you’re not very handy yourself, you should have your electrician install it. As always, I prefer to have some order to my list. This time around, we’ll be counting down from the smallest to the largest machines. So if you’re planning to bring a unit into a home bathroom or you have small office restrooms, you can use one of the products at the top of the list. On the other hand, if you’ve got plenty of space in your bathroom, you can check out the machines near the end. Of course, the size of a product doesn’t really have anything to do with the amount of noise it makes. And in any case, the difference is in an inch or two. So I’ll also make it a point to specify the amount of noise each machine makes in decibels if the manufacturer provided that information. Now without further ado, let’s get into the reviews. This 1400-watt Aike hand dryer is a small but effective one. The rectangular unit with rounded edges is 9.25 inches tall, 9.84 inches wide and 6.49 inches thick. It has a 5.6-foot power cord, but you can also have someone hardwire it. The dryer has a sturdy ABS polycarbonate cover that’s easy to clean. The front of the machine is very clean-looking, with two LED indicators in the middle. If you look at the bottom side, you’ll find an airflow outlet in the front and a removable and washable filter in the back. The filter will ensure that the air that’s blasting your hands at 235 miles per hour isn’t contaminating them at the same time. The dryer also has an infrared motion sensor between the filter and the air outlet, as well as a power switch to the right and a heating switch to the left of it. If you want to save energy, you can do so by keeping the heat off. But even if you turn the heating switch on, the machine will only use hot air when the room temperature falls below 77 degrees Fahrenheit. Depending on the temperature of the air, which can move between 68 and 104 degrees Fahrenheit, your hands should be completely dry within 15 seconds. Better still, this machine makes only 76 decibels of noise, which is about the same amount of noise as your TV makes. That’s not the worst a hand dryer can do, but we can do better. The next product on my list is this 2,000-watt hand dryer from Alpine which, even though it’s more powerful than the last one, produces less noise, at least according to the manufacturer. In fact, the company claims that this little machine makes only 60 decibels of noise. Let’s see whether the other features match this claim. Right off the bat, the fact that this product claims to be able to dry hands in 30 seconds makes me believe the 60-decibel claim as well. As I have mentioned before, the drying speed is often, though not always, related to the amount of noise a machine makes. However, some users have also noted that the unit managed to dry their hands in half the time. So the fact that the machine actually stays on for the full 30 seconds is an annoyance. Now let’s talk a bit about the shape and features of this hand dryer. Unlike the previous product, it’s more curved than box-shaped, measuring in at 9.5 inches tall, 10 inches wide, and 9 inches deep. It has a 31-inch long power cord, which appears to be the only thing you’ll need to get it to work. There are no on/off switches on this device as far as I can tell. Instead, it seems that the machine powers on automatically using the built-in infrared sensor. Additionally, the manufacturer has made no mention of an air filter, although they assured users that their dryer is both antibacterial and antimicrobial. 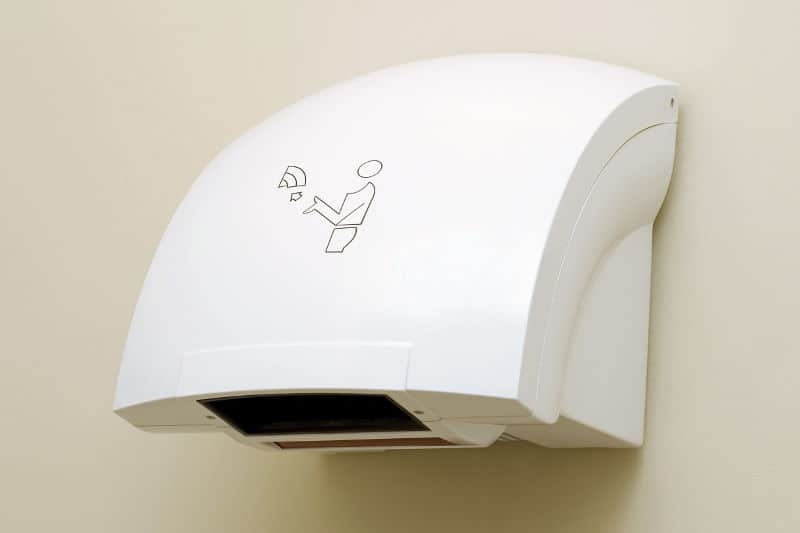 The PENSON & CO. hand dryer is one of the products that made no concrete claim as to the amount of noise it makes. However, the company marketed it as quiet, and the users seem to agree, so I’ve decided to include it. The sleek and shiny machine would fit in very well in office building restrooms. It’s 11.6 inches tall, 8.2 inches wide and only 2.2 inches thick, making it one of the slimmest models on my list. Like the first product on my list, this one has an airflow strip at the bottom with a removable filter further back. There’s also an infrared sensor in the middle and two switches to the right — for heat and power. I should also mention that this 950-watt dryer is capable of using 212 miles per hour airflow. That will get your hands dry in no time. Overall, this is a very attractive unit. However, you should be aware that, like all the others, it’s made of ABS plastic with a brushed silver finish, not real metal. This Palmer Fixture hand dryer claims to make only about 55 decibels of noise. For reference, that’s about as loud as a regular conversation in a quiet room. So let’s see what a machine would need to sacrifice in order to achieve that result. But to begin with, let’s talk about the appearance of the product. All things considered, I’m not too thrilled with this asymmetrical box-shaped dryer. I can see that they tried to make it interesting, but it just seems bulky to me. In fact, the unit is about 9 inches tall, 10 inches wide, and 7 inches deep. The cover is made of white ABS plastic which is, of course, fire resistant. This 1,800-watt unit operates with an 80-watt brushless motor, which is actually pretty weak. In fact, the manufacturer states that the machine takes about 30–40 seconds to fully dry hands. Still, this product is capable of blasting 138-degree Fahrenheit air thanks to its 1,700-watt heating element. Like most other units on this list, this one has an infrared proximity sensor with adjustable sensitivity. The airflow is open for as long as your hands are under the machine, though it stops automatically after 2 minutes, in case you’re planning to use it in unforeseen ways. I know plenty of people who’ve had to dry their clothes or hair on hand dryers. Because this unit doesn’t come with a power cord, the manufacturer cautions users against installing it themselves. Instead, the dryer can be hardwired by a professional electrician. This Awoco hand dryer may not be the quietest one on my list, but it sure is one of the most interesting-looking options. The 1350-watt unit is cylindrical in shape, with a flat back for easy installation. The circular base is 6 inches in diameter, with the flat back adding another half-inch to the mid. Furthermore, the whole cylinder is 11 inches tall, encased in durable stainless steel. As always, the sides and top of the device are all sleek, while all of the functional features are at the bottom. The air outlet and the infrared motion sensor are front and center. Additionally, a large part of the bottom side is fully removable, so you can take out the air filters and wash them according to the instructions. This device would be able to dry your hands in about 15 seconds using an airspeed of 152 miles per hour. Usually, the air temperature sticks at around 99 degrees Fahrenheit, though it can move between 68 and 104 degrees. At about 40 inches away, the amount of noise this thing would be making is 72 decibels, which is about as loud as traffic. As a last aside, I should mention that this product can only be powered by a cord. So hardwiring isn’t an option, which means that you’ll need to install this device near an outlet. There’s one thing that makes this 1,800-watt hand dryer from Alpine stand out to me: the color choices. So far, all we’ve seen from the devices on my list are white and gray, and a bit of metallic. However, this hand dryer comes in white, black, dark gray, stainless steel, chrome, brown, and even red colors. Even though this is as simple as making the box covers different colors, I’m sure plenty of people will be happy to have an attractive addition to their bathroom. Other than the color choices, though, not much is remarkable about the design of this device. It has the typical rectangle shape with rounded edges, measuring in at 11.2 inches tall, almost 12 inches wide, and almost 7 inches deep. The cover is made from stainless steel, which should make the machine easy to clean and durable enough for public restrooms as well. Apparently, this is another hand dryer you’d have to hardwire. It’s powerful enough to get your hands dry in a matter of seconds. However, that comes at a price. Namely, the dryer makes 80 decibels of noise when in use, which would make it about as loud as a vacuum cleaner. Still, it’s better than having upwards of a hundred decibels. The final product I wanted to consider is this 1,500-watt XLERATOR hand dryer. This unit is box-shaped with a rounded front. It’s also 12.3 inches tall, 11.4 inches wide, and 6.7 inches deep. The rounded cover is all made of one piece of thermoset polymer to protect against any damages. As usual, the burst of hot air is activated by passing your hands underneath the device. However, the difference in the design of this unit is that it is available for purchase with or without a noise-reduction nozzle, which would keep the noise level under 90 decibels. The hot air is sure to have your hands completely dry within a few seconds. However, like some other models, you may need to call an electrician to hardwire it. And so we reach the end of our journey. Hopefully, these reviews have shown you what you can expect to see when you go shopping for a hand dryer. 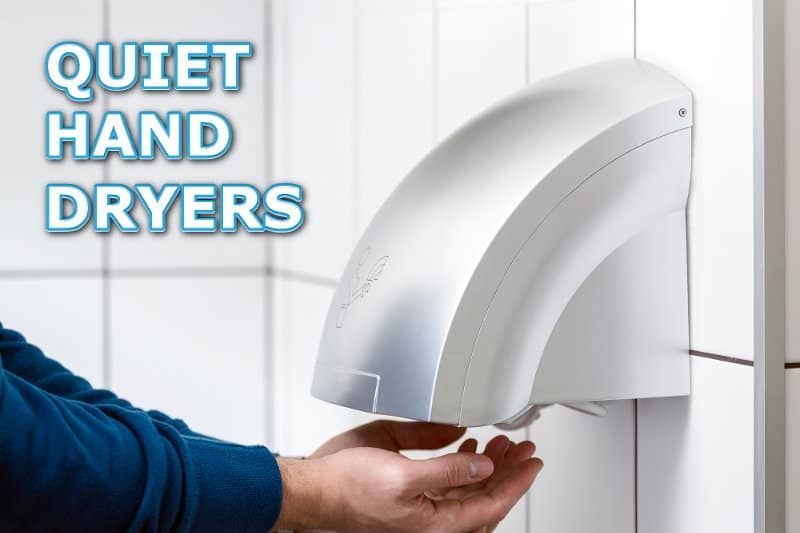 Whether you’re looking for new quiet hand dryers for your office, your home bathroom or even your kitchen, you’re sure to find a good one on this list. There’s really no need to put up with the old noisy models when there are so many quiet alternatives. And that’s something you should keep in mind no matter what you’re looking to buy: from electric shavers to hair dryers and more.